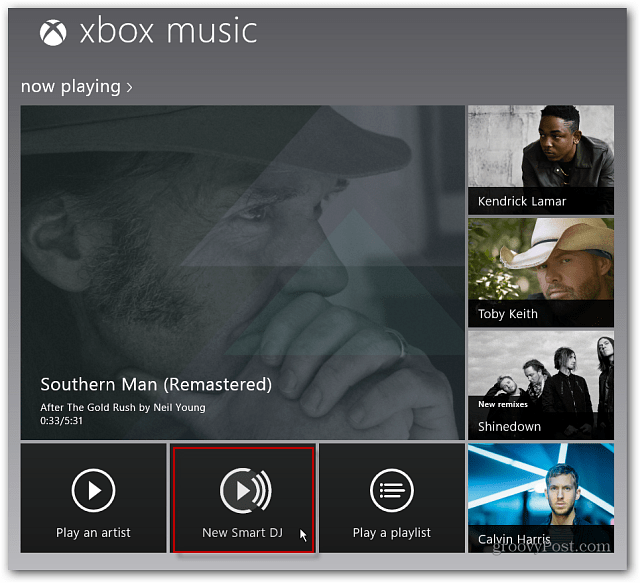 Xbox Music in Windows 8 has a groovy feature called Smart DJ. It lets you create a playlist based on music you like, similar to streaming radio in Spotify. 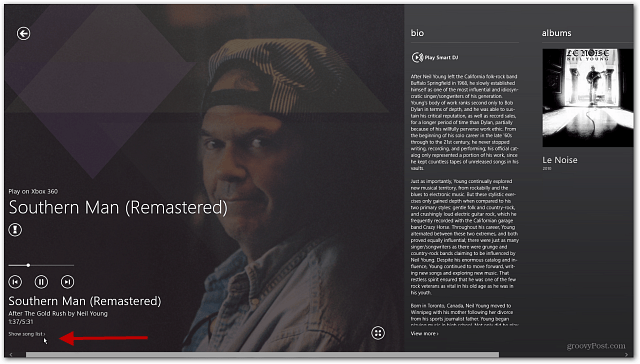 Xbox Music in Windows 8 has a groovy feature called Smart DJ. It allows you to create stations based on a certain band or artist and stream similar music – similar to Pandora or Spotify. Here’s a look at how to get started using it. 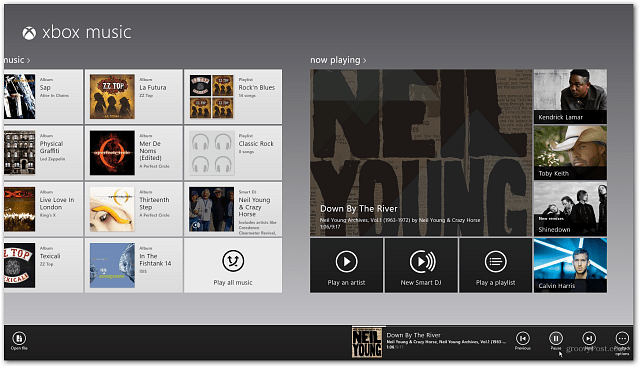 First launch Xbox Music from the Windows 8 Start screen. When it launches, scroll over to Now Playing and select New Smart DJ. 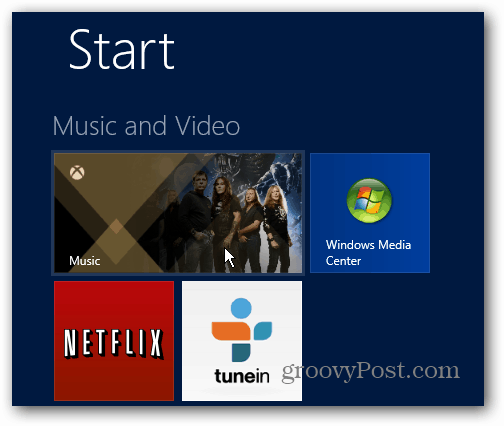 In the Windows that pops up type in a band or artist you want to create a station around. 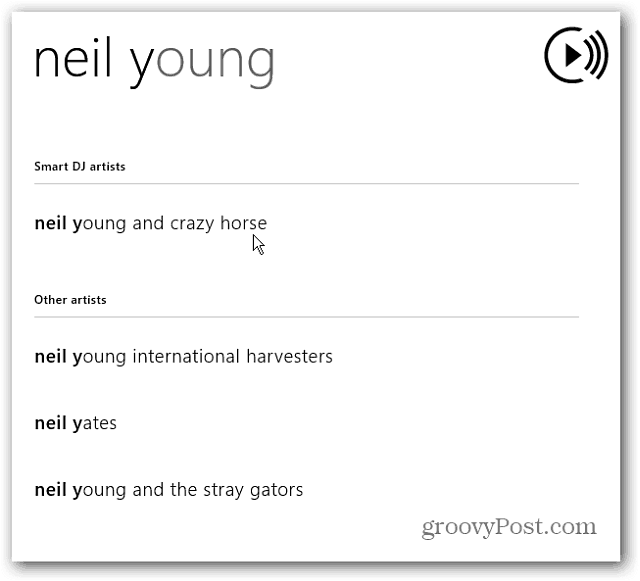 Then select the Smart DJ artist or similar artists from the search results. 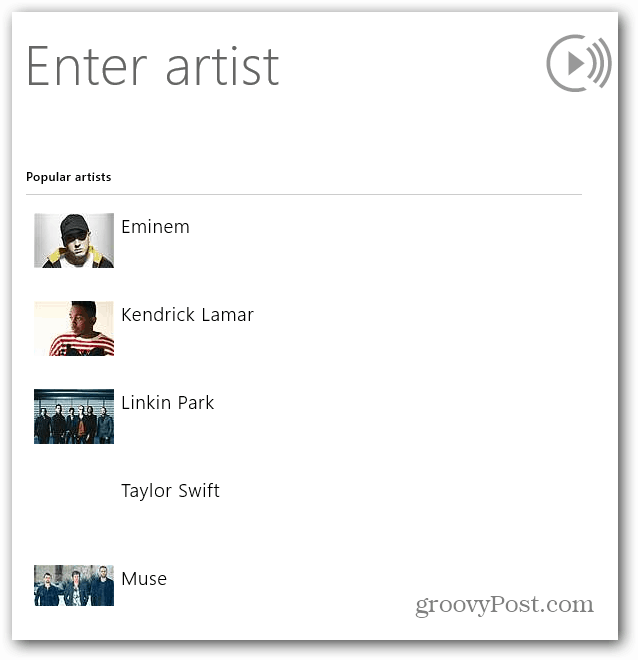 Alternately, you can choose from the list of Popular Artists without typing in anything. 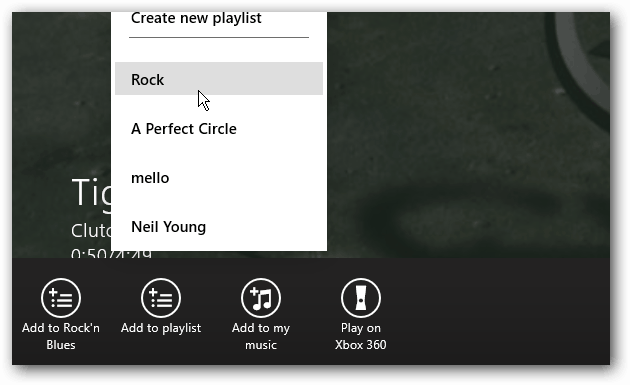 After choosing the band or artist you want to hear, it begins playing in the Now Playing section of Xbox Music. Right click anywhere on the screen or swipe from the top of the screen down to bring up the playback controls. Click on Now Playing to bring it to full screen. There you’ll have playback controls, cover art, band images, and a bio of the band or artists you’re listening to. Here you can also have it play to your Xbox 360 via the SmartGlass app. Under the current song that’s playing click or tap Show Songs List. That brings up a list of the similar artists that were related to what you selected. There you can select different songs to play or skip one you don’t like. The cool thing is it will display that band’s bio, album art and images. However, you aren’t able to thumbs up or down a song yet, only pick a different one. Hopefully this feature will be added with future updates so we can customize the Smart DJ lists. If you have Xbox Music Pass, when you right click on a song playing in Smart DJ, you’re able to download it to your music collection and select a Playlist for it. You’re able to make essentially as many Smart DJ Lists as you want. Go into My Music and there you can add or delete the lists. 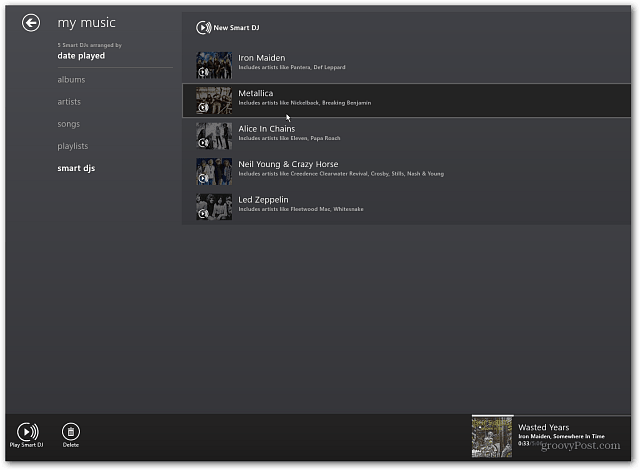 Xbox Music is in its infancy and doesn’t have all of the features I’d like to see. But it will inevitably get better as time rolls on. 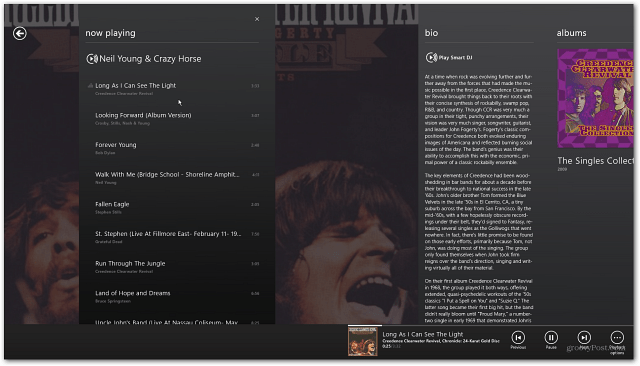 What do you think about the new music service in Windows 8? Leave a comment and tell us about it. I tried this program on my Windows 8 laptop today for the first time, and Smart DJ doesn’t actually appear to do anything. It tells me it’s building a playlist related to the artist I entered, and an hour later I’m still seeing the same message and not listening to music. This program seems like a total waste of hard drive space. The program would be a good alternative to Pandora. It looks like it even has better music – BUT it seems to play only ONE song! At first I liked it, but I’ve been listening to music that i have stored on my local harddrive (that I own.) It works well as an app running as a tile on the side of my second screen. But then suddenly, an advertisement for Progressive Auto insurance. Wut? An advertisement inserted pandora-style into the middle of music that’s playing from my local harddrive? That is wrong, man. So, so wrong.